Disney/Pixar’s Wall-E hits DVD today and I’m excited. Not only is it another hit for the studio, but it’s also one of my favorite movies this year. Getting to watch it again in the comfort of my own home is something I’m looking forward too, particularly because it is such a gorgeous movie. I can’t wait to have the chance to take in more of the details in the backgrounds then I was able to see in theaters. Of course, one of the things Pixar is notorious for is shoving in references to their own movies. Fans of the studio’s work love scouring through their pictures to find characters from some of the other movies, or the ball that Luxo Jr. chases in their animated short. 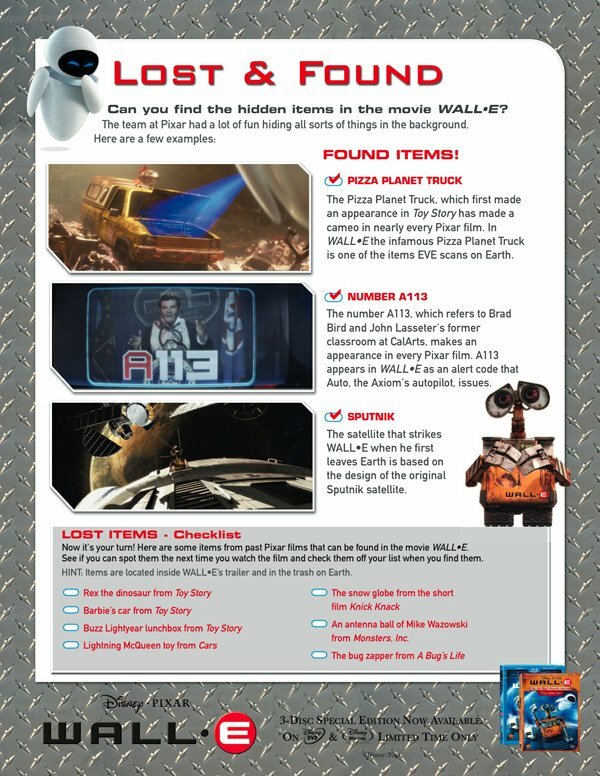 In celebration of the release of Wall-E, Disney has sent over a kind of cheat sheet for this scavenger hunt of Pixar characters and items. The sheet helps you find two of the more common references (the Pizza Planet truck and the number A113), as well as pointing out the appearance of Sputnik in the movie. It then goes on to provide a checklist of other Pixar references in the movie. Use this cheat sheet to look for some of your favorite characters from Cars, Toy Story, and A Bug’s Life the next time you watch Wall-E.